Back in September after Faversham lost the opening game of their season 82-10, away to Cliffe; Director of Rugby Rob Dengate challenged the boys to bounce back. Not many saw coming what happened next. In the following 15 games, Faversham would go on to win 13 times, scoring 439 and conceding only 150 points in the process. They would also pick up 10 try scoring bonus points; the most in Kent 2 this season. The Castaways went into this game with no pressure having smashed Sittingbourne in their own backyard last week 45-5 to secure promotion with a game to spare. However for some, it was the biggest game of the season. The humiliation of what had happened in September was still well in the memory of the boys who played that day and revenge was the only option. After the second team played Sheppey in a friendly earlier in the day, nearly 200 spectators came down to the rec to watch a bruising encounter in which the home side started the better. From kick off captain McDermott claimed the high ball and burst over the gain line with the first carry of the afternoon. After strong support play from Jaynes and Egleton, Tabor got quick ball and found fly half Payne who sent the ball into space with a kick into the opposition 22, forcing the away side to clear their lines and take the ball up to the 10 metre line. Faversham opted for a five man lineout and Mills was found in the midfield. The ‘magic man’ then went on one of his trademark bulldozing runs, taking out five defenders and carrying the home side into the Crusaders 22’. Garnham then also carried strongly before the away side were penalised for killing the ball at the breakdown. Skipper McDermott opted for the points and Payne duly obliged, giving ‘Sham an early 3-0 advantage. Faversham nearly doubled their lead straight from kick off. Egleton took the high ball and offloaded to Mills who made his second line break in the opening ten minutes. He took the ball into the opposition half before Tabor provided Payne with quick ball. He opted to miss Sanders-Champney on the hard line to find Ollie Jaynes in space outside him. Jaynes beat the first man for pace before slipping the ball to winger Gray who used his blistering pace to make 15 yards before being tackled into touch. Faversham’s defence was proving too much for the away side, especially in the midfield. Sanders-Champney continuously drove back his opposite man despite being significantly the smaller of the two men. It was his midfield partner Jaynes whose tackle led to the next points being scored however. Jaynes made a dominant tackle on his opposite man before Mills got his hands on the ball at the ruck leading to Cliffe being penalised for not releasing. Payne stepped up to slot the three points to double Faversham advantage and make the score 6-0 in favour to the home side. Cliffe then responded with a good try moments later. After a period of intense pressure, the home side were unable to hold out any longer and Cliffe scored out wide after a strong carry from their second row making the score 7-6, now in favour of the away side. The next five or so minutes were a bruising affair, with both sides looking to dominate the tackle. Mills, Garnham, Jaynes and McDermott were putting their bodies on the line for the home side with a number of huge tackles, stopping everything Cliffe threw at them with a level of ease and confidence that has become more and more apparent over recent weeks. Faversham thought they had re-taken the lead moment later only for the referee to rule it out for a forward pass. Another strong carry from ‘Magic Mills’ provided quick ball for Payne. He used Jaynes as a decoy and found Sanders-Champney behind him on the deep line. He then found Egleton out wide who broke the line. Drawing the last man Egleton passed inside to winger Gray. Gray nearly made the line himself but offloaded back to Egleton for what would have been an excellent team try. Unfortunately, as the Castaways started to celebrate they noticed the referee standing 20 metres back signalling a scrum, after a controversial forward pass decision. It wasn’t long however until ‘Sham did re-take the lead. A delicate chip in behind forced the Cliffe fullback to clear his lines. Kingdon claimed the loose ball on the halfway line before passing the ball to fly-half Payne in the 15m channel. What happened next was certainly a contender for try of the season. Payne firstly stepped outside of his opposite man before beating him with pace down the wing. He then sidestepped inside the winger, before doing the same to the opposition full-back and number 8 before sliding over the whitewash for his fourth league try in five games. He converted the extras to make the score 13-7. Faversham then suffered a blow moments later. Flanker Nick Kingdon went down clutching his hamstring and after assessment from the physio, it was clear he couldn’t continue. It mean a premature end to another superb season from the openside flanker but it allowed Kyle Fiddler to take his place, returning from an injury that had kept him out for more than two months. Cliffe then hit back almost instantly with a penalty of their own after Mills was controversially penalised for handling at the ruck despite being on his feet in what appeared to be a textbook steal to every other player and spectator watching. However the Cliffe fly-half stepped up and slotted the three points to reduce the gap to three points and make the score 13-10 to Faversham. With both teams looking content heading into the break with the score at 13-10, a moment of genius extended the home sides advantage. After Faversham secured the ball at a scrum 35 metres out and with nothing appearing to be on, fly-half Payne sat himself in the pocket and sent a drop goal attempt sailing through the uprights. This made the score at the break 16-10, with fly-half Payne having scored all 16 points and notching up a first half full house (try, conversion, penalty and drop goal). Faversham were now playing down the slope and started the second half with fire in their bellies. They were awarded a scrum inside their own half after a knock-on by Cliffe and they opted for a training ground move. Mills slotted into the centres and Sanders-Champney moved to flanker. Mills took the ball straight from Tabor at the base of the scrum and ran a hard line at his opposite man. With Jaynes running a hard line off him at Cliffe’s 13, Mills slipped the ball behind to Payne. Payne then found full back Woolf outside him who had a 2 on 1 against his opposite man. Woolf drew his man and slipped the ball to Gray who made 30 metres before cleverly cutting into the middle of the pitch. Strong carries from Garnham and McDermott followed before Mills crashed over for his 14th try of the season on a superb line, in just 12 games. Payne once again added the extras to make the score 23-10 to Faversham. Faversham went close on a number of occasion through Gray and McDermott but for the next 10 minutes Cliffe held firm and started to get back into the match. Despite strong runners, Cliffe were starved of the quick ball they wanted. This was largely down to a superb shift put in by 20 year old debutant Dodge Campbell. The youngster was everywhere on the pitch after coming off the bench early due to an injury in the first half to flanker Egleton. It was indeed Campbell whose influence at the breakdown led to the next try. Campbell stole the ball at the breakdown leading to quick ball for Tabor at the base. Strong carries from the forwards to edged ‘Sham closer to the try line before Hall came off of his wing to find a hole in the defence and score under the posts. 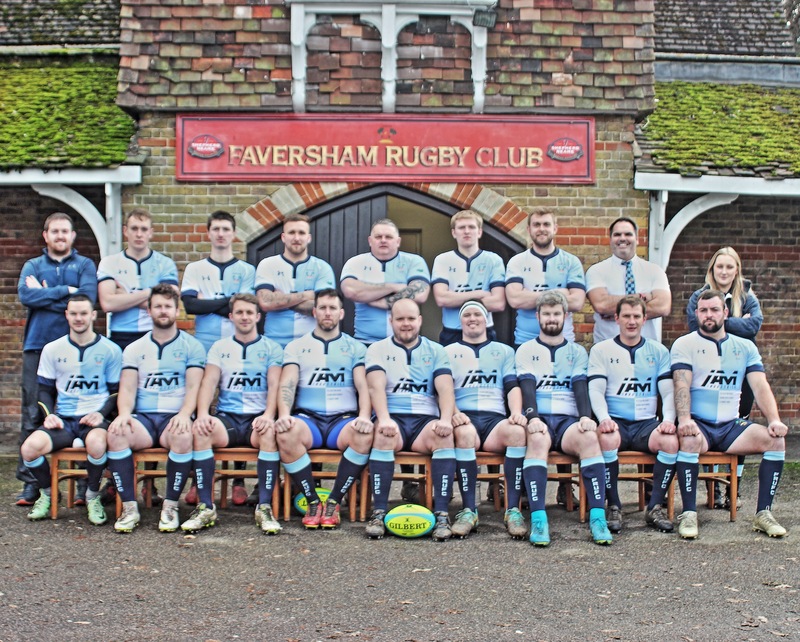 Faversham play Southwark Lancers on April 28th at Charlton Park RFC in the final of the Kent Salver. Kick-off is at 12:30pm.